Butternut squash soup is one of the great joys of the colder months. It's so soothing and warming. But often it's laden with loads of cream and butter. 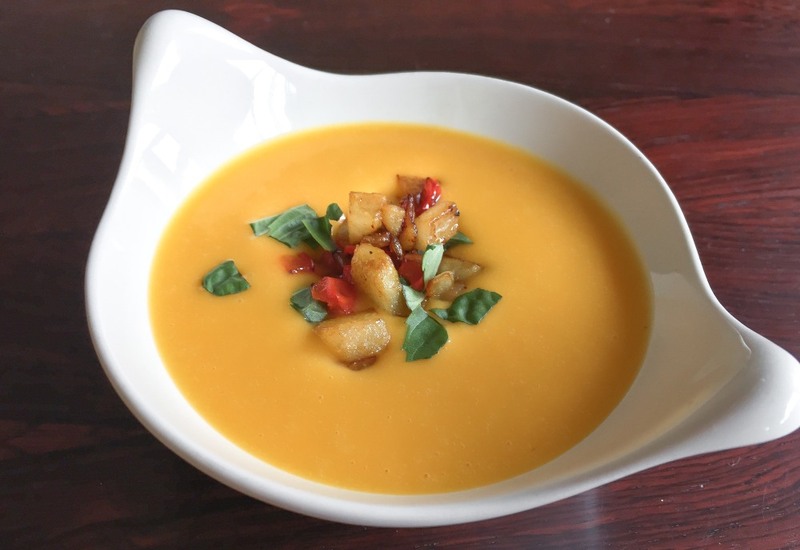 This recipe for vegan butternut squash soup delivers a rich creaminess with dairy-free coconut milk. It's finished with curry-spiced caramelized pears, onions, and red bell peppers, which give the soup that addictive combo of sweet and savory flavors. The freshly torn Thai basil adds an intriguing note, making the soup taste both familiar and exotic, and most of all, absolutely delicious! Butternut squash can vary in sweetness so be sure to taste the soup prior to seasoning with palm sugar. The soup should be delicately sweet but, you know, not give you a toothache. If you can't find Bosc pear, use any pear variety. Be sure to select a firm fruit that will become tender when cooked but not turn to mush. If you don't have palm sugar, regular granulated sugar will do. Sadly, there's no substitute for Thai basil. Skip it altogether if you can't find it. Per Serving: 323 calories; 29g fat; 18.5g carbohydrates; 3g protein; 0mg cholesterol; 115mg sodium. I love butternut squash! This soup is perfect for those this Fall weather here in Seattle. I lessened the amount of palm sugar to half a tablespoon as I really wanted the sweetness from the butternut squash to shine on its own- and I'm not a fan of overly sweet things. The caramelized pear was also a nice touch which I have never used in a soup before. Living solo, this made a large helping for me so I froze the rest for a later time. I made this recipe but without the pear. I also used heavy whipping cream instead of coconut milk. I love the flavors from the pepper, really good. I used roasted red peppers in place of the fresh bell pepper, it was so good. I even converted this recipe to make in my pressure cooker. Such a simple dish that's quick to make. I made this recipe in my pressure cooker with just a few adjustments. It was a little sweet, but not overbearing. The curry spices definitely helped to tone the sweet flavor out some. Also could not find Thai basil, so that's a little disappointing.